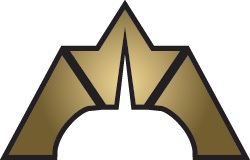 Last week, I flew from North Carolina to California to compete in the Star City Games Invitational Tournament, a Magic: The Gathering tournament with eight rounds of standard and eight rounds of legacy. It was the first time I qualified for such a high profile tournament, and although I didn't have high hopes for placing in the top eight, I was excited about seeing how I matched up against some of the country's toughest competition. My results weren't pretty. 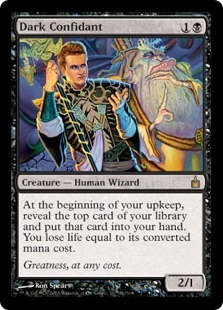 In fact, it was probably my worst performance since I brought my UW aggro deck (featuring School of Piranha) to an Urza block Type II tournament. I was embarrassed... but I'm still going to share the worst of the weekend and the lessons I learned. #1 problem with this list? Not enough early game punch to have such a weak late game. #2 problem with this list? Terribly rotten sideboard. 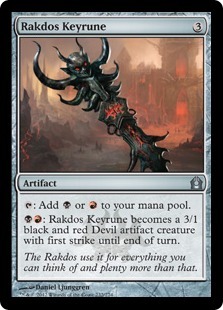 In the first game, we traded attacks until he stabilized with a Rakdos Keyrune. I couldn't get anything relevant through, and he continued hitting me for a few points a turn until he put me away. Game two came down to my ability to scavenge Dreg Manglers. It made my guys big enough that I could swing in without worrying about trades. In game three, he stalled on three lands. 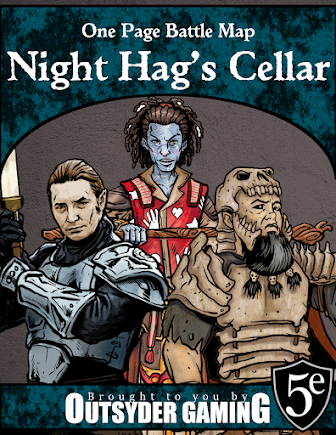 While he was still making plays, they weren't as relevant as the Thragtusks that started hitting the board on my side. Game one went pretty quickly. I put on early pressure, he slowed me down with Supreme Verdict, and I continued the onslaught with hasty guys. Game two was a lot closer, and I had what might have been the worst brain fart of a turn that I've had since I started playing competitively. I can't even explain what happened, to be honest. I don't know if I stopped paying attention, or if his line of play seemed so foreign that I lost my mind for a minute, or what... but he made several plays and my brain just did not compute the sequencing. I remember ending my turn and saying, "You would think I had never played this game before!" It was that bad. 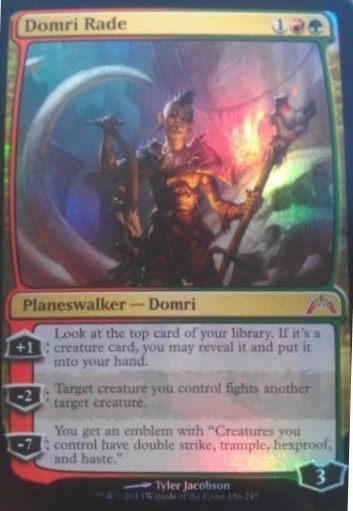 The only thing I remember clearly is that one of his plays was a pivotal "Searing Spear your Garruk, Primal Hunter" that happened mid-combat before I activated him for the turn. Needless to say, I lost. Game three was close as well, as we both developed a decent board state and were trying to race. 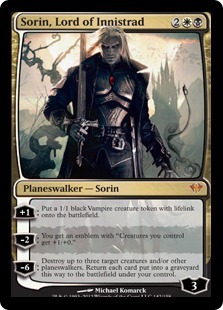 I was swinging with everything I had but getting chump blocked left and right by Augurs of Bolas and Spirit tokens from his Moorland Haunt and getting very little damage through. Meanwhile, he was whittling my life total away a few at a time with a Restoration Angel that I couldn't block. 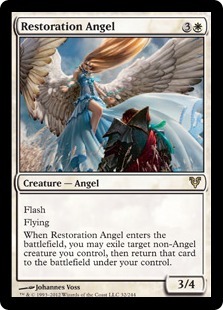 I was finally able to deal with the Restoration Angel with topdecked spot removal, but he slammed a Drogskol Reaver that really threw off my math. 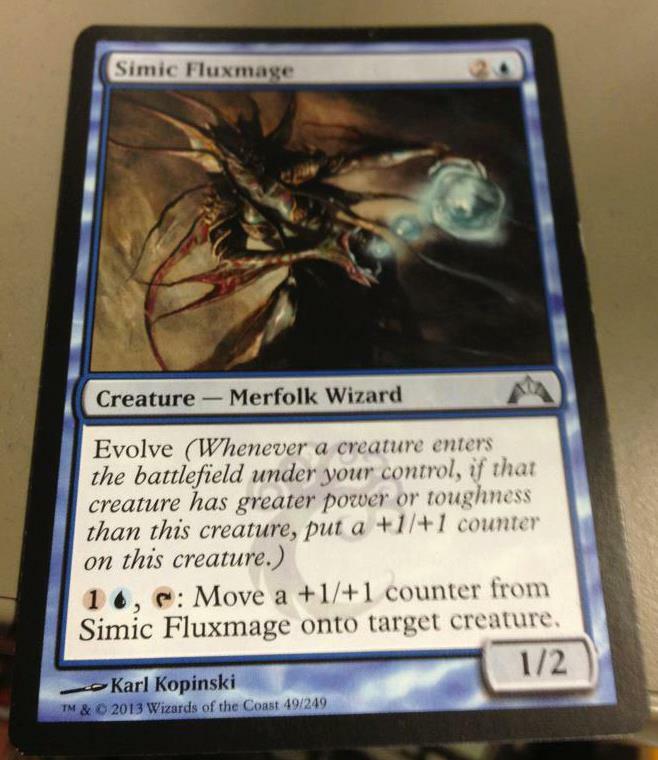 On my last turn, I did a lot of math and figured I could get him down to five, so I scooped. After the game, he pointed out that I had missed a Huntmaster of the Fells trigger on my last turn, and that he thought I might have had it. I tried to remember the exact board state, but I couldn't figure out if it would have actually made the difference or not. Game one we both mulliganed to five. He must have kept a land-heavy hand because he didn't miss a land drop for a while. I kept a hand with one land but double Farseek, and if I had drawn anything, I might have at least put up a fight. Instead, he played Sphinx's Revelation for some number and just got way ahead of me. In game two I kept a pretty beefy hand with three lands, a Dreg Mangler, a Huntmaster of the Fells, and two Thundermaw Hellkites. I even topdecked a Strangleroot Geist for additional early pressure. 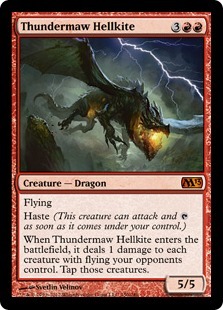 However, while I did see my fifth and sixth land drops, I never hit another red source to play either of the Thundermaw Hellkites. #1 problem with this list? Terribly rotten sideboard. #2 problem with this list? 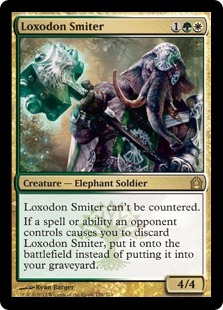 Piloted by an inexperienced legacy player. Neither of us were happy about our results so far, and we chatted a bit about the frustrations of our losses in standard. 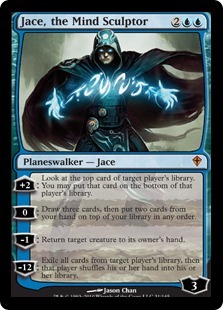 Game one was pretty even until an unanswered Jace, the Mind Sculptor ran away with the game. In game two, we both traded discard spells until we ended up in a topdeck war. A timely Maelstrom Pulse answered both sides of his first Lingering Souls, but I couldn't deal with the second. I didn't take good notes on this match, but I remember getting a first turn Deathrite Shaman in both games. In the first one, he had an answer for it pretty quickly and he ran away with the game on the back of a Jace that I couldn't find an answer for. In the second game, he matched my Deathrite Shaman with two of his own, and the Tarmogoyfs I kept drawing were pretty pathetic. 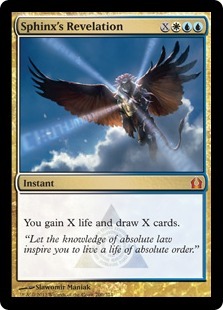 I should also note that I managed to overextend into a Pernicious Deed in game two as well, which was particularly embarrassing because it just so happens to be one of my favorite cards of all time and I should know to play around it. Ugh. #1 problem with this list? Thrown together the morning of the tournament. #2 problem with this list? Lack of focus. 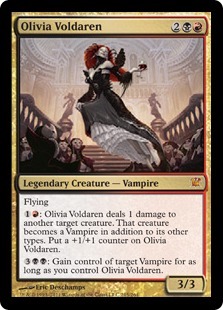 I felt like if I played more of a midrange jund deck, I would be able to hang with the control decks into the late game by continuing to drop bombs rather than trying to start out fast and nickel and dime them to death if the game went long. I still think the mindset is right even if my execution was terrible. Knight of Infamy and Wolfir Avenger are just very out of place in this deck. I often found myself playing them rather than ramping and then regretting it a turn or two later. 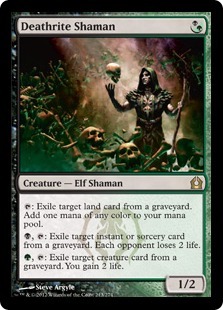 In game one, I shipped a double Thragtusk five land hand that in hindsight I probably should have kept. My hand of six had no lands at all, and my hand of five only had one. I kept it, knowing I was in a bad spot but scared to mulligan again, and I got punished. Game two was much more even, but I stalled on four lands with a Thragtusk in hand. 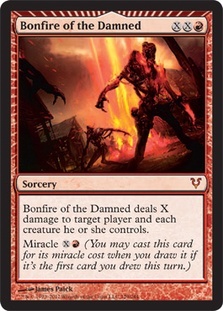 I could have miracled a Bonfire of the Damned for three on my last turn, but I needed something to deal with the Thundermaw Hellkite that was presenting lethal damage. No such luck. 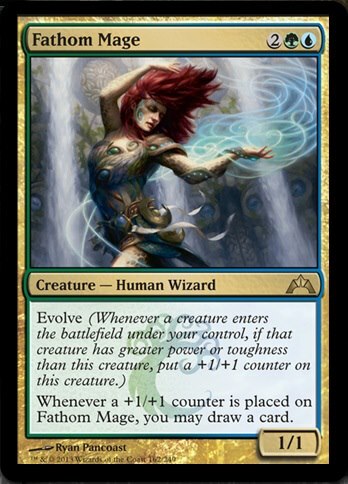 I'm just going to go on the record as saying that Naya midrange has been my nemesis of late. 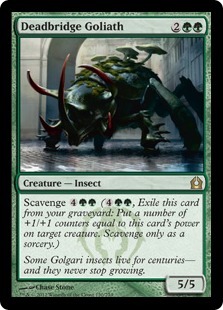 I've won fun matches against it, but in actual tournament games I haven't won a single game against a Naya deck. Not matches... no, I haven't won a single game against it. As soon as I saw a Temple Garden followed by a Clifftop Retreat, I knew I was in trouble. I should have put in a lot more testing against this match-up, but I just ran out of time. He steamrolled me in two games, plain and simple. My records show that his life total only increased while mine steadily decreased. I didn't manage to get in a single point of damage. Blegh. I was pretty frustrated at this point and ready to just quit. Fortunately, this match felt a lot better. It was a matchup I had playtested against a fair number of times and felt comfortable with my chances of winning. Game one went just the way I expected it to. 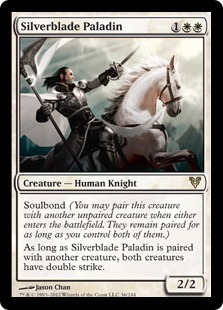 I held removal for the cards I knew I needed to kill (Silverblade Paladin and Wolfir Silverheart), and used my beefier creatures to beat down the rest of the way. In game two, he got a blazing fast start and put me away while I was still stumbling around with Farseeks. In game three, he kept a hand heavy with mana dorks, and I punished him with a turn three Bonfire of the Damned for one, knocking out an Arbor Elf and an Avacyn's Pilgrim. He got stuck on two lands, and just wasn't able to keep up. That's right, folks. 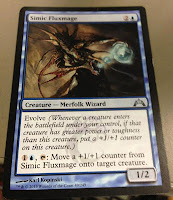 It wasn't UWR midrange. It was a spirit themed deck, complete with Dungeon Geists, Favorable Winds, and Angel of Flight Alabaster. 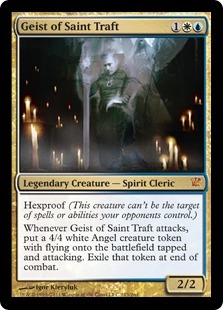 Unfortunately, it also featured Geist of Saint Traft, and letting that hit you several times before you can hard cast Bonfire of the Damned is pretty tough to beat. 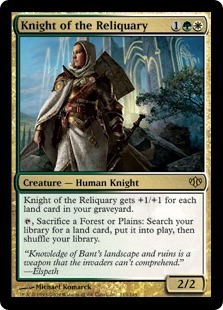 I thought Knight of Infamy would be a huge help, but he had removal for it every time. This loss was tough to swallow, and I just wanted to leave at this point... so I did. I learned quite a few lessons that weekend, many of which I will share in my next article. However, as disappointed as I was in my performance, competing at a higher level has whetted my appetite for tougher competition. I'm going to be hitting the tournament scene pretty hard over the next few months, and hopefully I'll have better results than these.